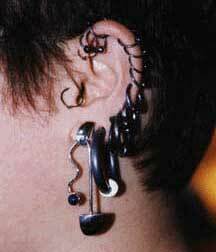 One of the most widely accepted body modifications found in cultures all over the planet is the pierced ear. Modern piercing techniques allow for easy piercing and more successful healing, especially for cartilage piercings. The modern primitives movement has brought the stretched ear loop to Western culture after a long low-profile existence in the South Pacific and Africa over the last few thousand years. Ear piercing is very straightforward. A tiny hole is made through the ear tissue, usually in the fleshy lobe at the bottom of the ear. Permanent jewelry is worn in the holes, allowing the holes to heal open, giving the person pierced ears. Modern techniques are usually either a piercing gun or a hand technique using a slant-tip needle. The hand technique is more precise and utilizes a sharper instrument which is much less traumatic to the tissue. Most modern piercings studios utilize the new sterile hand techniques, but ask how the person performing the piercing received their training and what methods they prefer and why. All tools should be sterilized and single-service, meaning they get used on only one person and then properly discarded. The jewelry worn in pierced ears falls into a few categories. Stud earrings are usually tiny decorative fronts attached to short posts, held in place with a small earring back that slips onto the post. Hoop earrings are either the loops worn through the ears themselves, or any earrings the utilize such a wire as the foundation for the earrings. Hook earrings come in many shapes and styles, all based on the idea of a bent wire that hooks into the hole in the ear with some sort of dangle supported from the wire. Tiny hoops with decoration are best for newly pierced ears, as they are light and allow for ease of movement for healing and cleaning. Well-established piercings can support heavier dangles comfortably. Ears can be pierced just about anywhere from the lower lobes to the thin rim that runs around the entire shell of the ear. Newer piercings include large gauge holes in the conch of the ear, or rings through the ridges of the conch. By slowly increasing the gauge of the ear jewelry, soft tissue piercings can be stretched to form ear loops, much like the style of the Dyak people of South Borneo. Not all cultures encourage the pierced ear. When I was in graduate school, several Chinese classmates told me that no Chinese girl would get her ear pierced all the way around the edge like I have as they believe that there is a spot on the ear that controls all your luck. They were afraid that if they hit that spot, they would become unlucky. To pierce or not to pierce then becomes a very individual decision. I guess it was sometime in high school that the idea of having earrings go all the way around my ear became a permanent, vivid concept in my brain. It was something I had been contemplaing since my sophomore year, when I made a second piercing in my left ear with a safety pin. The sewing needle I had first started with was too flimsy and bent instead of piercing, ouch! It was still the days of piercing guns and I wasn't happy with those. My first 'alternative' piercing was the tragus piercing I had dreamed of way back in high school, but didn't know you could actually do. I freely added earrings all through college, often preferring to get two at once, up the rim of the ear. 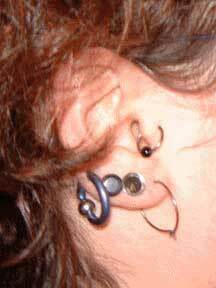 The tragus came after I'd finished my undergrad college and was living and working in Santa Cruz. Once I started coming up the coast from Santa Cruz to San Francisco, and going to Body Manipulations, the earrings just flowed at a steady rate. Two here, three there; it was just as easy to heal two as one. After awhile, I started stretching them by adding more tiny hoops to each hole. Later I crafted FIMO pieces when the holes got to 8-4g. At 4g I started getting metal jewelry to wear. I kept the jewelry lightweight, so that the holes would stretch around evenly and not downwards so much. Tough as it is, cartilege can be stretched, however, you must be able to recognize when your ear is trying to tell you to stop.